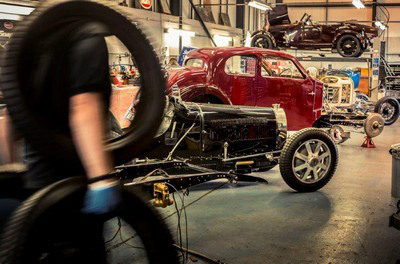 To restore vintage Bugatti cars built during the golden era of motoring back to their former glory, you need desire, passion, integrity and a high degree of skill, expertise and experience. It also has to be done sympathetically and authentically. The company is located near the University City of Oxford and not far from Silverstone, the home of British racing and Formula 1 expertise. 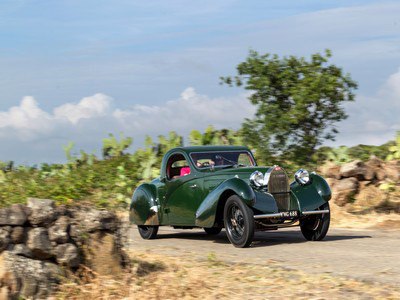 Consequently, it has attracted highly-trained and skilled mechanical engineers and machine operators that collectively have over 200 years of experience working on Bugattis. The basic philosophy of the company is to restore rather than replace. The team always strives to at least reproduce but can often improve on the high standards of quality achieved by Ettore Bugatti himself. To achieve this, the company has developed many ways and processes to re-use original valuable components that other restorers have simply condemned and claimed as unusable. Ultimately it is the customer's choice but the team at Gentry's can deliver complete projects in any style from mechanically perfect, with no loss of patina, to gleaming potential Concours D'Elegance winners. Over the years the Gentry team has built-up tried and tested partnerships with highly-skilled and experienced sub-contractors with experise in upholstery, bodywork and electrics. Whilst this specialist work is sub-contracted, everything is overseen and carried out to Gentry's exacting quality and standards. Gentry Restorations regards it as a privilege to play a part in restoring and maintaining their client’s wonderful cars. Every member of the team understands the importance of each individual vehicle's heritage. There is no compromise when it comes to standards and quality. The aim is to at least maintain and, more often than not, improve the value of a vehicle. Perhaps even more importantly, everyone wants to ensure that every Bugatti owner really loves and enjoys driving their treasured vehicle. Gentry Restorations is, and always will be, a specialist in the vintage Bugatti marque. However, the expertise and skills of the team are transferable and the company welcomes restoration projects, repairs and servicing on all makes of vintage vehicles. No matter what level of work is undertaken, all clients can rest assured that it will be carried out by people with a passion for excellence. For all restoration enquiries, feel free to contact the Gentry team for sound and professional advice.